From the most popular nonprofit organizations like UNICEF, Save the Children and the American Red Cross, to the ones that maintain a low profile like the Nature Conservancy and World Wildlife Fund, all have got a solid web presence. Hence, you can understand that a website is a necessity rather than a luxury for running a nonprofit or charity today. However, when it comes to charity website design and development, we often notice their owners being stuck with some of the other kind of misconceptions. Misconceptions are impediments to logical thinking. They are the detriment to constructive effort and forward progress. Hence, we thought to highlights the few critical ones along with their counteractive measures. Most of the nonprofits think that building a shiny website is all that they need to do to get volunteers and donors. They start bothering their website design and development agency from the very beginning when they fail to get the expected results. This is the height of impatience. Remember, Rome wasn't built in a day. Besides the money, you have to invest time and effort in understanding what your audience are looking for. If you fall into the same category, we recommend you follow this exercise. Once your website is live, ask your people to open your website and share their candid experience. We are human beings, so it’s quite possible that we miss on some parameters. Hence, take help of your webmaster or web analytics tool to understand the behavior of users on the website. The analytics will help you track the user response through different browsers and devices. Whatever findings you come across, make it a point to share all with your website development company. This will serve as a guideline for them to optimize the user experience. Most of the times, people see websites merely as pages of a brochure and end up creating a literature out of it and then expect their audience to read it. In reality, such a passive approach doesn’t work in the digital world. The web is all about interactive engagement through texts, media-rich content, etc. Here a quick response is expected out of every action. 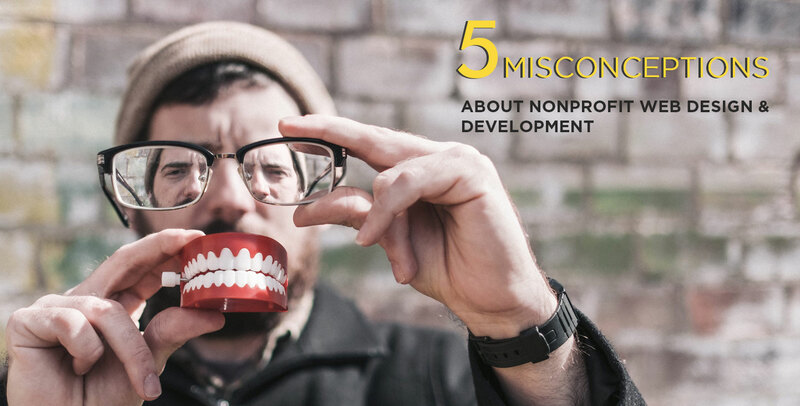 Shun the brochure narrative while pursuing the nonprofit website development. Ask your website developers to make every section of the website and, in fact, every page as much interactive as possible. Integration of blogs, social media widgets, subscription button, comment box, etc. are means to make a website interactive. In the quest of getting a responsive web design, at times, several charity owners develop an obsession of keeping each and every element of their website visually identical across all browsers. Here they go wrong. Every browser is different from the next, and even in the same browser, there are different versions that often support different technologies. Every browser or browser version renders code differently. So, let the web developer you hired, make your website compatible with browsers or browser versions that your audience uses the most. Any issues or bugs that surface with a particular browser must be handled accordingly. However, the attempt to fix issues with one shouldn’t play foul with the compatibility of other browsers. In the fast-paced world, what is modern today is likely to go outdated tomorrow. Hence, don’t put undue pressure on your website designers and developers to deliver a perennial website. Scalability and flexibility should not be interpreted wrongly in an attempt of making a future-ready website. Try to stay relevant to your audience with your website user interface and user experience. Let them access and navigate through your website in a quick and easy manner. Not just the nonprofit website design (theme color, navigation, buttons, etc. ), but the portrayal of a message is also of significant value. The quest of delivering the best user experience comes at a price tag, and you should be ready to pay it every now and then. In fact, website maintenance is not just about fixing any issues, rather it’s striving to keep the website error-free, running at its best and enabling users to connect effortlessly with the organization and its people. In the wake of the unpredictability of website problems and evolving nature of the web, you don’t know how frequently you might need a website maintenance job. Hence, it’s better to go for a comprehensive maintenance package from a reputed web development company. Apart from saving in terms of frequent website maintenance costs, an on-demand website maintenance service makes sure that the website will be up and running all the time.